Clinical records, patient history, reports, billing information, medical research, the healthcare industry is flooding with data and to keep all intact is getting way out of the league. Thankfully, technology is always at the rescue with some exciting innovation, one among which Blockchain, is doing wonders in the healthcare industry. Healthcare today is shifting towards a patient-centric approach. Quality healthcare services along with the most recent and fresh technology are the need of the hour. With the increase in a number of ailments and patients, it is impossible to collect and manage information of each patient. The systematic way of managing such huge data is very difficult. No wonder managing records have been shifted from paperwork to digital records; however, still, the problem persists of sharing the data between systems. The solution of which is, Blockchain, the answer to all the data management problems. Blockchain is the most attention-seeking technology. Basically, it acts as a distributed ledger which helps track transactions and activities taking place throughout the network. Its step by step implementation will eventually help store the complete medical history and the related data in an organized way. This, in turn, will be beneficial for analysis and future use. Not only the data management is an issue but also exchanging the data is a tedious and time-consuming process. The innovation of Blockchain is a boon to Healthcare Industry. The confidential information of patients scattered across multiple systems can be streamlined using Blockchain. The medical records can now be shared easily and securely. The clever cryptography will handle all the nuances offering scalability as well as data privacy. Data management issues won’t be a concern anymore. Authenticity at its core will validate and verify all the transaction before adding them to the chain, thus proving to be completely genuine. Even after a lot of challenges to adapt the Blockchain technology in the healthcare system, the realistic application of Blockchain can go a long way in solving the looming problems. Let us check the benefits of Blockchain technology and find out why it is important to implement the same. One of the biggest challenges Healthcare is facing is the absence of a centrally administered database. Comprised of bits and bytes, the database is still a tangible thing and hence can be easily corrupted and tampered. With the implementation of Blockchain, the need for central administration would be eliminated. Everyone who has access to the database will have control over all the information and transactions. Once the data is centralized, no longer will there be any dependency on the middlemen. The existing gap between the providers and the payers will be done away with only quality healthcare services. Currently, the data is scattered across different systems and departments, making it difficult to fetch the required information as it is not easily accessible and available when needed. There are strict rules and regulations to be followed with regards to a patient’s data. As per HIPPA (Health Insurance Portability, and Accountability), the patient’s health information should be completely secure from any breaches and alteration. Despite the stringent rules, patient data is not restricted and 100% safe. A patient has to share his health-related information with the doctor as well as the providers. One has to share such confidential information even with a chemist when buying medicines. Take, for example, Factom, an IT company is employing blockchain technology into the healthcare system so as to securely store digital health records of the patients that can be only accessed by the authorized person. Introduction of Blockchain will resolve many issues associated with the complex data-centric system. It will also help patients filter and provide only the necessary data to the third party, maintaining secrecy pertaining to their identity. 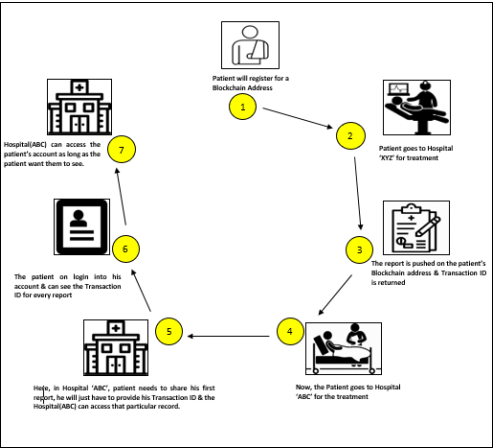 Where third parties come into the picture, the time limit and access permissions for sharing the data can also be controlled by the patients. A loss of billions of dollar per year is the result of fake drugs being counterfeited with the original. This imitation of drugs leads to deaths of hundreds for taking wrong drugs. Such dissemination of fake drugs is a serious concern today. The only way to overcome this very problem is security. Blockchain technology makes every new transaction unchangeable and time stamped making the alteration of drugs impossible like Blockpharma does. It helps patients from taking counterfeit medicines as well in tracing their drugs. Implementation and usage of private blockchains ensure the control to be retained with the central authority, exclusively. Now, the pharmaceutical companies will have the right to decide and choose their miners in the supply chain. From manufacturers to retailers, everyone will have their own set of different rights and accessibility options. The attachment of hash to every block of drug information will make the traceability of drug in the supply chain very much easy and possible. It will also eliminate the circulation of fake drugs. Blockchain shall certainly make Healthcare system easily operable and affordable in the future. The probability of the use of Blockchain technology still depends highly on the acceptance rate, but once implemented, is sure to disrupt for good. Creation of technical infrastructure in the Healthcare ecosystem will take the healthcare sector to a different level. It is undeniable to conclude that the Blockchain has the potential to be the infrastructure. Again, it is not the end. Technology can advance anytime bringing better technology and can turn the things in a jiffy. For now, Blockchain sure is the solution.